My dog Sulley is the best! He is a fluffy, loving, 4-year-old Maltese Shih Tzu mix. I got him when he was a puppy, around the same time I became chronically ill. I can’t imagine my life as a chronic illness warrior without him. He brings me so much happiness. I decided to make a list of the ways my dog helps me cope with my chronic illness to help those of you who are considering bringing home a new furry friend. Dogs are the most loyal creatures on earth. They don’t hold grudges, and no matter who we are or how sick we become, they still think we are the greatest. You can see it in the way they wag their tails and become super excited when we come home. You can also see it in the way they always want to be near to their humans. Dogs love their people no matter what! Not a day goes by that I do not laugh at least once at the hilarious antics of my dog. Laughter really is great medicine. Often when I am in a lot of pain and am feeling awful I will look over and see him playing and just being a dog. He always makes me smile and laugh, which makes me feel better. Sulley only weighs 12 pounds so he is the perfect size to sit on my lap. Overall he is a pretty low-energy dog, which is perfect for me, because my illnesses prevent me from being active most of the time. I love being able to lie down when I am feeling poorly and have him curl up next to me. He is content to sit with me and be petted for hours at a time. It is easy to go through life as a chronically ill person focusing only on the pain we are experiencing. The pain is always there so we focus on it more than anything else. Dogs are great because they provide a distraction from our symptoms. Sulley is great at this! Due to my joint pain and nausea, I have a hard time exercising or doing anything that is even moderately active. I need to exercise because exercise has been beneficial to many people with my conditions, but it is so hard to do. Sulley gives me extra motivation to exercise. When I see how much fun he has when I walk him or take him to the park, it motivates me to exercise more with him. Walking with him as opposed to walking alone is great because I am watching him the whole time and it distracts me from the pain I am in. All dogs need some form of exercise every day. Since Sulley is a small dog he is happy with a 20 or 30 minute walk, which is what my goal is right now. After that he is almost as tired as I am and chills with me while I recover from using so much energy. I am always feeling sick or in pain to some extent, but there are times when everything accelerates and I feel even worse than usual. Every time this happens, Sulley somehow knows and lays down next to me with his head on my stomach. He doesn’t leave until I am ready to get up. I don’t know how he knows that I am feeling worse than normal, but I am grateful that he notices and stays with me! Chronic illness can be very isolating. We don’t get to go out and socialize as much as we would like to, so we tend to feel lonely a lot. Dogs are a great remedy for loneliness. Even when I am not able to be out with my friends, I am not really alone, because I have my little furry buddy. Sulley loves people, but he and I have a special relationship. He follows me around all day. If I am resting, he is in bed with me. If I am in the bathroom he sits outside the door and waits expectantly for me to come back. If I am playing piano, he sits with me and listens to the music. If I am doing my physical therapy exercises, he licks me and watches me do my therapy. He is so loyal and stays by my side no matter what. I am so grateful God has allowed me to have a dog like him. Because I am physically unable to go to college or have a job currently, I sometimes feel like I am not being productive or contributing to anything important. Having a dog gives me something to take care of. I have to make sure he has food and water and that he gets sufficient exercise every day. Training dogs and teaching them new things is also very fulfilling. I can see concrete progress every time we practice his tricks and obedience commands. We both enjoy our training sessions, and they don’t take very much energy on my part. So now you know how having a dog helps me as I live with chronic illnesses. He truly brings me a lot of happiness and makes life with chronic illness a lot easier! 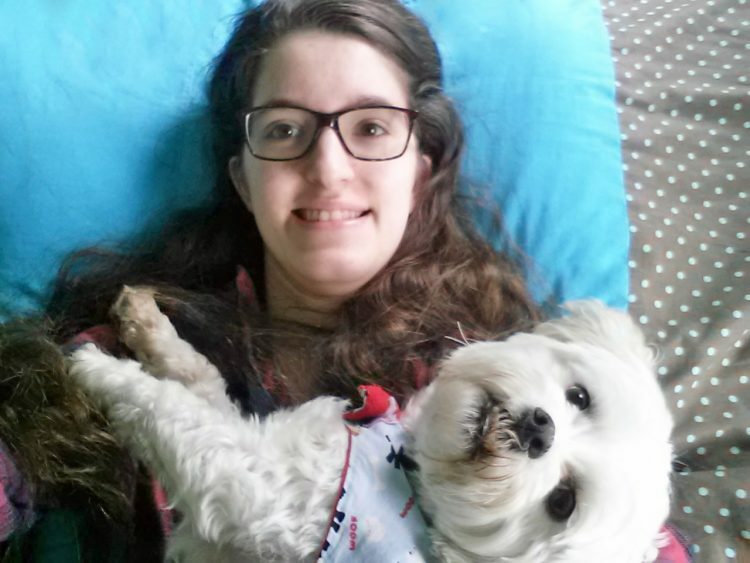 Ally is a teenager who has been journeying through life with chronic illnesses for 4 years. She has Dysautonomia(POTS), and JHS. She loves to encourage people who are sick like her through her blog chronicallyconstant.wordpresss.com.